A boogie-boarder was encircled by a large wave off Ala Moana Beach Park yesterday. Waves were small but good at the spot. IT WAS a surfer's paradise on Oahu yesterday, and forecasters are expecting more of the same today after two swells and strong tradewinds converged to kick up waves on all four shores. "This is a treat for us," said Doug Fernandez, who got off work a couple of hours early yesterday to catch some waves at Ala Moana Beach. "There's surfing on all sides of the island." Wave faces reached as high as 8 feet on east-facing shores yesterday, prompting a high-surf advisory through 4 a.m. today. National Weather Service forecaster Robert Ballard said the eastern shore's waves, which will dip to about 7 feet today, were caused by a "wind swell." Surf along south-facing shores, meanwhile, was between 4 and 7 feet, using the weather service's measurement system. The North Shore got 6- to 10-foot surf, and west-facing shores saw wave faces of up to 6 feet. 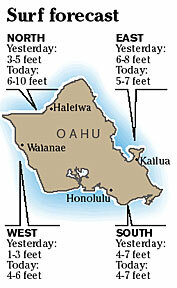 Wave heights on the South, East and North shores are expected to remain steady through today, the weather service said. "Everyone's happy, basically," said Pano Paahao, a surfing instructor who went surfing off Ala Moana yesterday as soon as he finished a (shortened) workday in Waikiki. "There's something for everyone." He said he couldn't remember a time when waves were ready for the riding on all Oahu's shores. "It's kind of unusual," he said. Jon Matsuo, a management consultant, rushed to Ala Moana beach from his home office yesterday afternoon after hearing about the south swell. He said he was taking an hour-long break to surf and then would head back to work. "For this time of year, (the swell) is a little rare," Matsuo said as he looked out at the waves from the sidewalk, his surfboard by his side, his hand shielding his eyes from the sun. "It's excellent." Waves heights on the south- and west-facing shores rose because of a swell generated in the South Pacific, Ballard said. A northwest swell caused by a low-pressure system in the Gulf of Alaska brought up surf heights on the North Shore. "During the transition season," Ballard said, "you can often have both the North Pacific and the South Pacific active with storms." South Shore swells are usually generated in the summer, while the North Shore gets its highest waves during the winter months.